Another big reveal from San Diego Comic Con as TFW2005 member ekocher has taken a picture of Optimus Prime from Transformers: Prime! 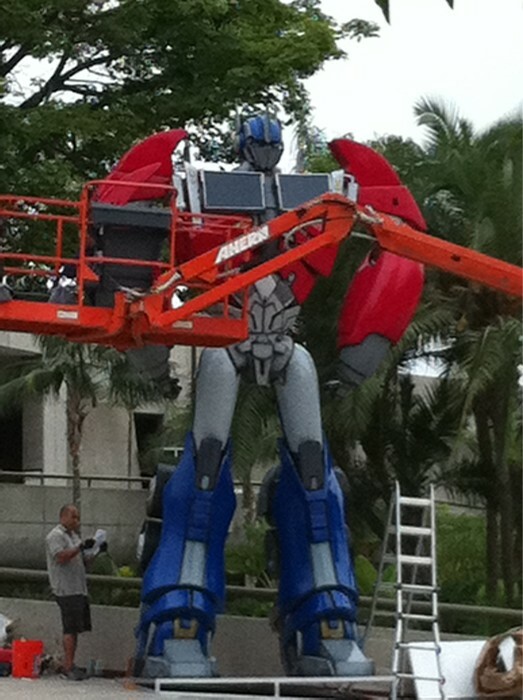 This Giant statue (seriously look at the guy next to it) shows that this Optimus will be a blend of Animated and Movie designs. Not much is known yet about how this Optimus will act, but check back tomorrow as TFW2005 will be bringing you more information from the Transformers: Prime panel live! Edit: Additional shots from staff added to first post in discussion thread at 3:45 AM EST. i like it but i bet it will look even better when we see it on the hub. I don't see how all the curved surfaces on these new designs are going to work on the toys… one mode or the other is really going to suffer. Eric Siebenaler mentioned something about there possibly being an Optimus toy during the Botcon panel (there were apparently also some rumblings about Bulkhead)…Hasbro's made great strides in the past decade in terms of resemblance to animation models, IMO, so that's probably why I tend to look that these designs as just another nut lining up to be cracked at the factory; I'm sure there'd be compromises, but I wouldn't expect anything much worse than what we've gotten in the past couple years. the alt modes look great in that picture above. Prime has a very copacabana look to him. He. Needs to mambo!. I don't know about this. Will wait for better pics. I really wish they would stay away from the whole animated look. It was good while it lasted. I was thinking that myself, Cliffjumper especially looks like a nightmare to try and engineer. Arcee doesn't appear to have any bike parts on her robot mode either, it looks like the wheels are in her heels but they look rather small if they are. Honestly I believe Hasbro now when they say they aren't doing toys, even after the movie and animated some of these look ridiculously hard to do. Ok, why do all of the TFs in TFP that we've seen so far look ripped? *notices the sudden stares from everyone else* What? The armor they have on looks like they'd rather spend time at the gym than fight bad guys. Hands not so tiny anymore. … actually he has big gorilla arms… let's see if anyone wants to claim that as a Beast Wars homage. Who said this isn't in continuty with the Movies? If I'm not mistaken, it was said during the TF-Prime panel. Though I'm not sure specifically who said it. It was also stated that TFP is in the WFC continuity. Is this just me or is anyone else getting a RID Prime vibe off this guy? Especially in the chest and thighs? It just reminds me of the shiny chrome alien detail on Prime's (stomach?). I get a RID Prime vibe from him too. It's probably the reason he's one of my favorite of the designs. I'm a big fan of RID, though I'm actually glad to see a Transformers TV show that doesn't have Prime transform into a firetruck (which hasn't happened since Energon). Must say I am dissapointed with how much Movie-like it is. I PRAY Megs will look like WFC, except he turns into a jet of course. Wait What?!! Three human kids?!!! Why can't we have some interesting adult humans like they had in Animated for a change? If there's anything I didn't like about Armada, it was the trio of annoying kids! !The comic's power trio, though, was just a little less annoying. Just because Armada got it wrong doesn't mean they will. Armada got most things wrong. Seen through the eyes of kids, alien robots should be all the more exciting. I'm sure there'll be adult characters as well. Where's Bulkhead? I was frickin' THERE at BotCon when they announced he'd be part of the main cast. Yeah, I was kind of hoping we'd get to see Bulky's new design, as well as Screamer. Eh well. All in do time. I really like Megatron though. Glad to hear about Welker mixing up the voice a bit. I'm eager to hear it. Also glad to hear that they're actually doing the whole "robots in disguise" thing, in where they actually are trying to keep a low profile. That was one of the very few things that bugged me about TFA. They just kind of threw that concept to the wayside. "Yeah, they're robots in disguise…Kinda…Sorta…Whatever." Miko… Oh lord, I KNEW she was going to be a Sari rip-off but I'd hoped they'd have more common sense than to actually go through with it. Jack… He is the offspring of the emo swarm spawned by Kicker and Sam. DIE DIE DIE. The other kid… PLEASE be better than Bud. PLEASE. But I'm loving the cgi so far!!! Them shiiinnny bots!! Ratchet is the best thing to come out of this year's SDCC. So far, visually, I love it. Haters can eat slag, this is the show I wanted back after I saw the 2007 film. I can't wait. I actually really like Cliff's redneck alt-mode with the horns on the hood. That's hilarious, but awesome. I'm actually getting a Verity vibe off of Miko. but maybe that's just me.